On Friday, the Wellesley community celebrates the reopening of the Dorothy Towne Fieldhouse and the opening of a brand-new Fitness Center with two days of events and festivities. The renovated Dorothy Towne Fieldhouse features a hardwood floor for basketball and volleyball competitions, arena seating for 500, three indoor tennis courts, a spinning room, a climbing wall, a four-lane 200-meter track, a high jump area, and a new long and triple jump pit. The crown jewel of the renovation is a brand-new 4,600-sq.-ft. Fitness Center. The Center features over 55 new pieces of cardio and strength equipment and a variety of other fitness related equipment, including kettlebells and dumbbells ranging from five to fifty pounds, as well as exercise balls, bands and ropes. A climate-controlled spinning room sits at the bottom of the ramp in the Fieldhouse and holds twelve spinning bikes. 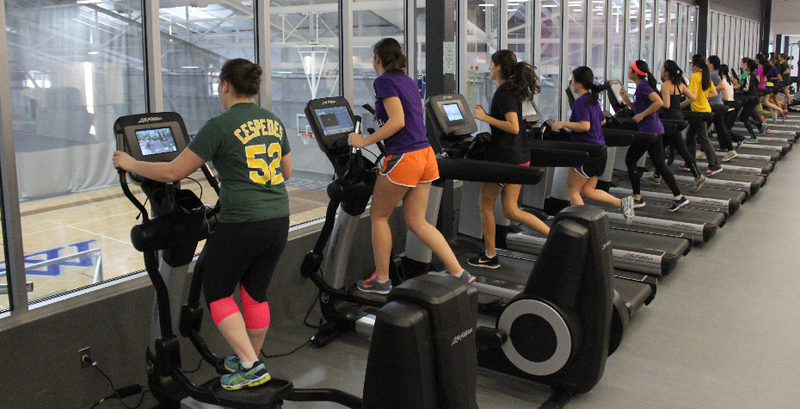 Separately, a new fitness area opened in Bates Hall to provide more dedicated exercise equipment on East Campus. To celebrate the new facilities, there is an Open House on Friday, February 13th, from 12-3PM, which will include a ribbon cutting (at 12:30) and Fitness Center orientations and tutorials on the hour. Festivities continue on Saturday, February 14th, with an alumnae athletics panel in the Alumnae Hall Ballroom, Field House reception, and home basketball game as Wellesley Blue takes on Mount Holyoke at 2PM. Bring your sneakers and your OneCard and get ready to exercise!